Hear me out on this. 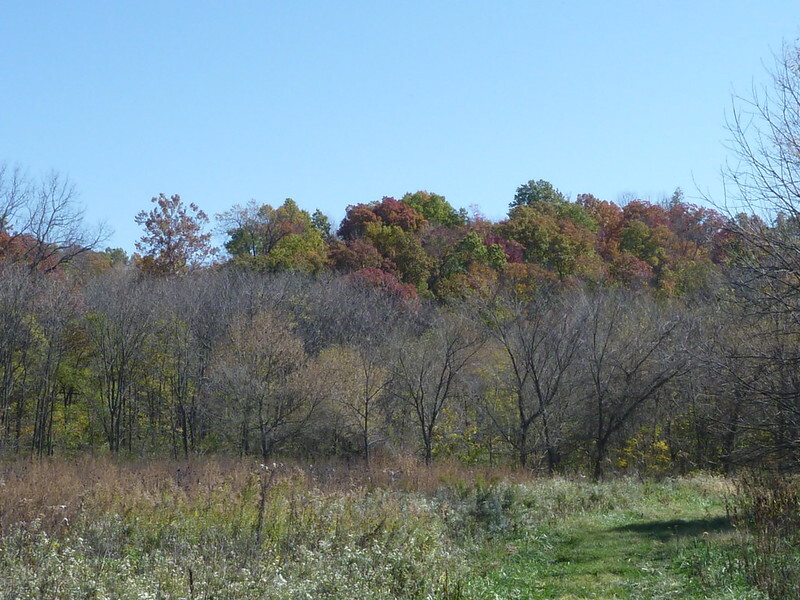 The forecast for the third weekend in October was for perfect fall weather so I decided to head down to southern Missouri to get in some color and some trout fishing. I called up Randy to see if he wanted to go and found out that he and Paula were already heading down and would be fishing at Roaring River State Park--one of the Missouri Trout Parks where you buy your daily tag to fish for fish that were stocked the night before. (of course there are holdovers but you get the idea) Now don't get me wrong, I have fished plenty of times in the Park and I enjoy fishing during the winter Catch and Release season but for this weekend I wasn't looking to fight the crowds you normally find at the park. Still Randy and Paula were arrive a day early so I asked if he would be willing to reserve a campsite for me on Friday night. Normally, the place is all filled up by the time I can get there after work, so this was an opportunity. I didn't plan to fish at the park but I did like the idea of camping. When I had just started my teaching careeer, Roaring River and other trout parks were often our family's destination for short and cheap vacations. 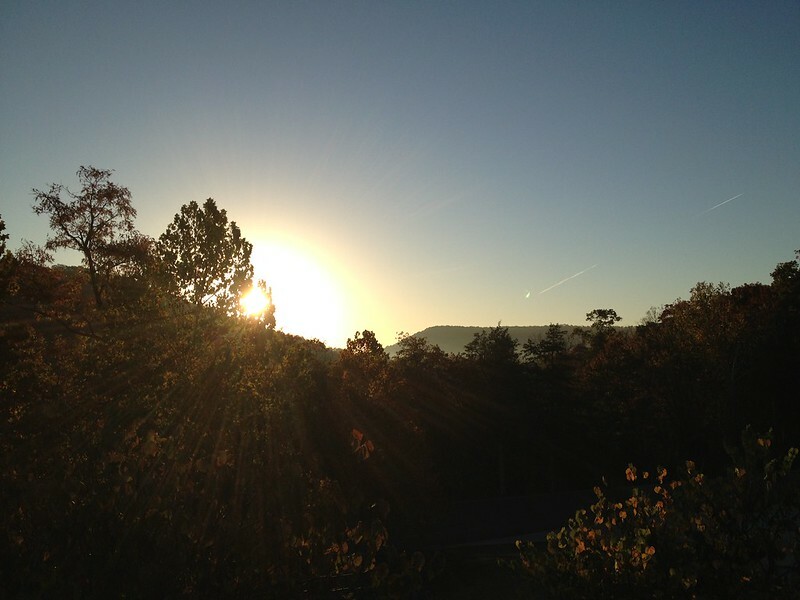 I've done a lot of camping and hiking in these parks with my young kids--lots of memories. Interestingly, we never did fish in those days. Randy did manage to snag a great campsite for me, right next to the creek and even purchased some firewood that he left on site to mark it as taken. The plan was for all of us to get together when I got there, sometime after dark, get the campfire going, and cook up some brats and marshmallows. I pulled into the campground just at dusk with no wind the haze from the campfires was intense. I went straight to my campsite but no wood. Seems that one of my "neighbors" decided to help themselves to our woodpile. Randy had already noticed and was up getting more wood. I went up to get two more loads of wood since I was figuring on a big, long fire and good times cooking brats and discussing how the day's fishing had gone for Randy and Paula. I was still planning to fish a nearby wild trout stream in the morning so instead of getting up to the siren that signals the start of fishing I headed up to the restaurant for breakfast and to let things warm up a bit before I hit the blue-ribbon water. Had I stayed I would have had to find room amongst all these folks. After a relaxing breakfast, enjoying the color of the Ozarks, I took off over the hills to a small creek, well known for its trout, wondering if I'd have to share the couple of miles of public access. Not a soul around though I eventually ran into a couple walking their dog. It was a day to be cherished with brilliant color, clear water and trout rising to foam beetles. So here is something to ponder. 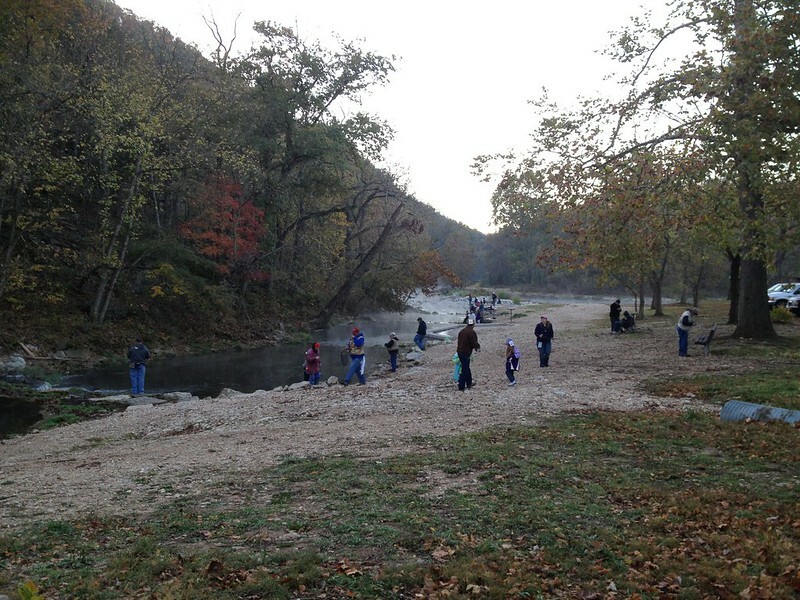 It seems to me that Missouri has hit upon the ideal way to manage it's trout resources. To fish in any of the four trout parks you have to have a daily trout tag. Approximately 400,000 daily trout tags are sold each year to adults and youths. It's been this way form more than 20 years. (info is from documents form the MDC). 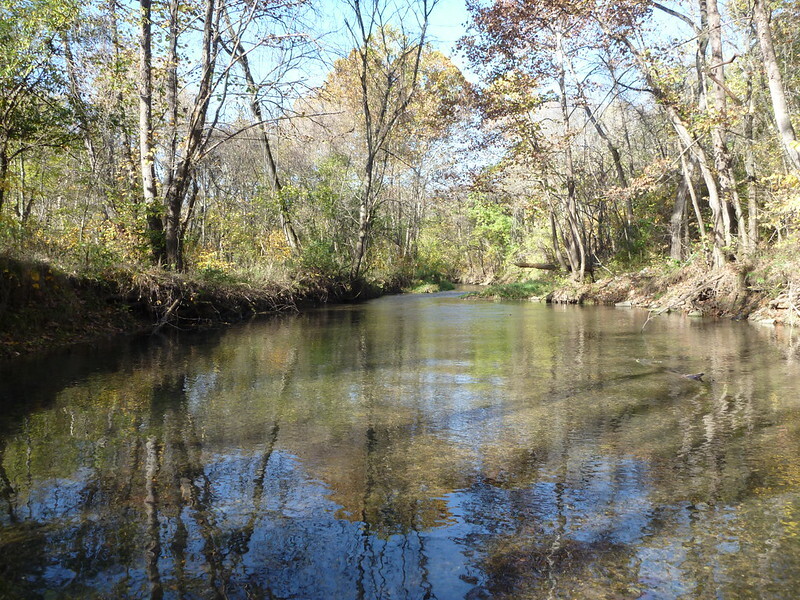 There are three large blue-ribbon trout rivers and about 6 creeks designated as blue-ribbon streams. 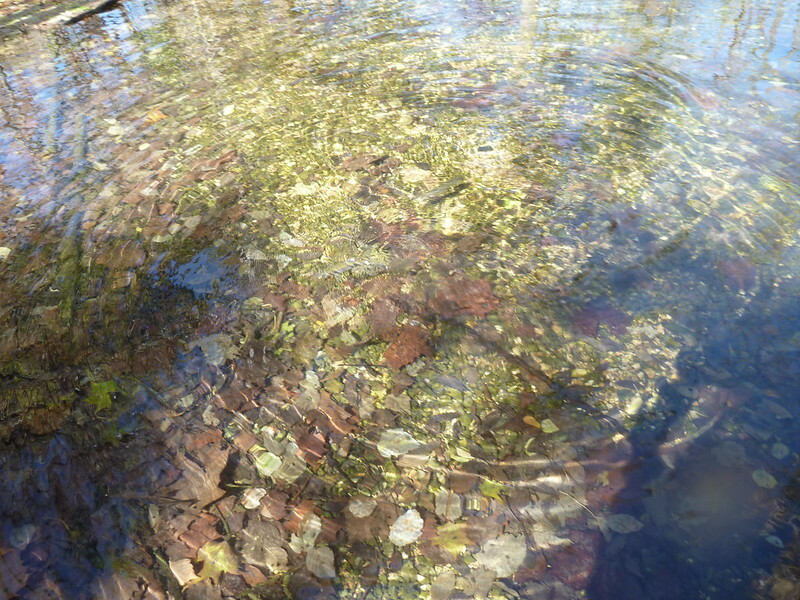 In these streams the trout are left to reproduce for themselves and they are essentially catch and release. There is limited public access to the streams. There is more access on the rivers but the rivers are best accessed by floating. With only a few miles of small, wadable stream can you imagine the impact if the trout parks did not exist? Imagine trying to accomodate more than a million hours of fishing a year on a few miles of stream like the one above. That is not sustainable. I really don't mind sharing a stream but I like to roam and try things when I'm fishing. I'm not comfortable sitting in one spot casting over and over to a holding area because the stream is too crowded to move somewhere else. Still, the folks that fish the parks during the summer, in large part all take home a nice string of trout to eat and they also take home a bunch of fine memories of good times with family. This is a brilliant system--works for everyone. They get their trout to eat and since I'm not looking to fill my freezer, I get a few precious moments of solitude, crystal water, and trout. These streams of course are fished by others but I am always amazed at how seldom I run into others and when I do they seem to be looking for the same thing I am. Typically, we talk a bit and then split up to find our own solitude. What a treasure. That works, and I'm envious on both counts! Love the perspective. Front Page. I would have a hard time fishing in the Trout Parks. The closest thing we have up here is private hatchery ponds. The fish farmers sell a lot of trout to restaurants and grocery stores, and they have parks for pay-by-the-pound fishing. I took my three year old granddaughter last summer and she was terrorized by catching a big rainbow that was at least half as long as she was tall. But a few weeks later she said, "Grandpa, I want to go fishing with you again." So maybe she's hooked. Most fishermen up here (including me) are spoiled by the abundant wild fish in cold small streams. The State of Wisconsin has over 10,000 miles of trout streams. Your blue ribbon rivers and streams are more like it. It's interesting that you find so few fishermen on them. Do the fishermen go after other species because the wild trout streams are so few? That would be my guess. Also, you write that "(i)n these streams the trout are left to reproduce for themselves. . . '" and then you picture a rainbow. Do the rainbows stay in the streams all year, and spawn successfully? That would be an interesting fish. In Minnesota and Wisconsin, rainbows (steelhead, actually) live in Lake Superior and run up the streams to spawn in the spring, but then they retreat to the big lake. They won't stay in the streams into adulthood. 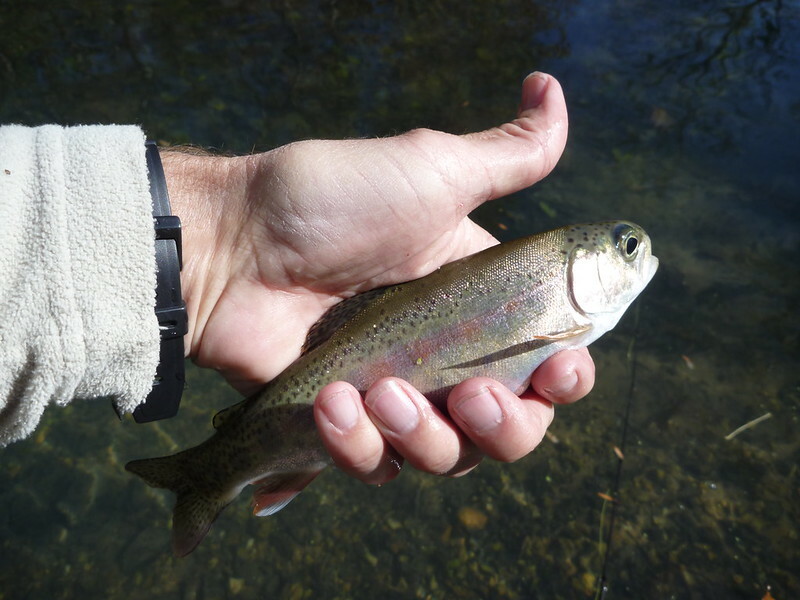 Rainbows are planted in some trout streams but they don't reproduce here and they rarely make it through the winter. You may have different genetics in your fish in Missouri. Many of our streams have reproducing populations of brook trout and brown trout, both of which spawn in the fall. The rainbows are spring spawners, and our spring snow runoff and spring rainfall floods make reproducing difficult. In some Lake Superior tributaries the steelhead do well (spawning) in some years, and poorly in others. Streams where trout can survive, let alone reproduce are in short supply this far south and this altitude. 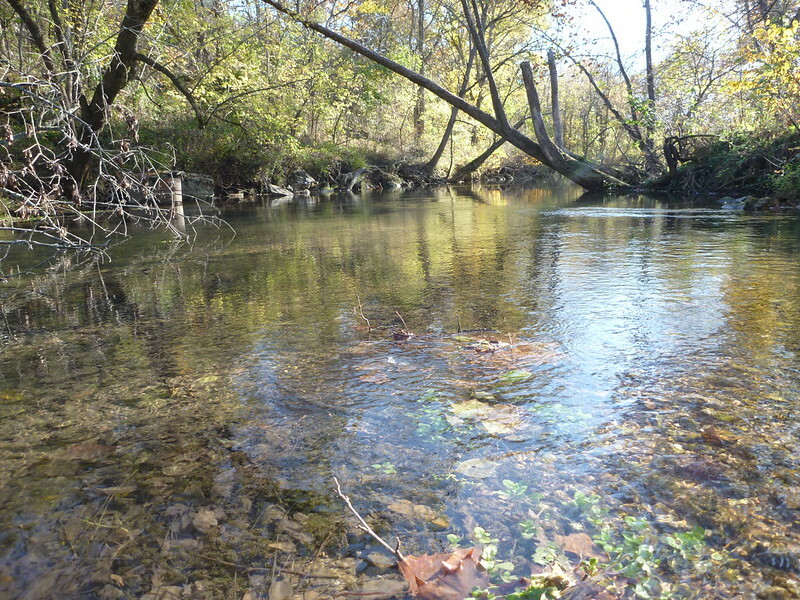 All of those Missouri streams with "wild" populations are in Karst topography and are spring fed. Some of the largest springs in the U.S. are in Missouri. Most of us in this group would probably not chose to fish the trout park if there was a stream nearby--which I guess is the point of the posting. I'm just glad the Missouri has figured out how to keep lots of folks satisfied. 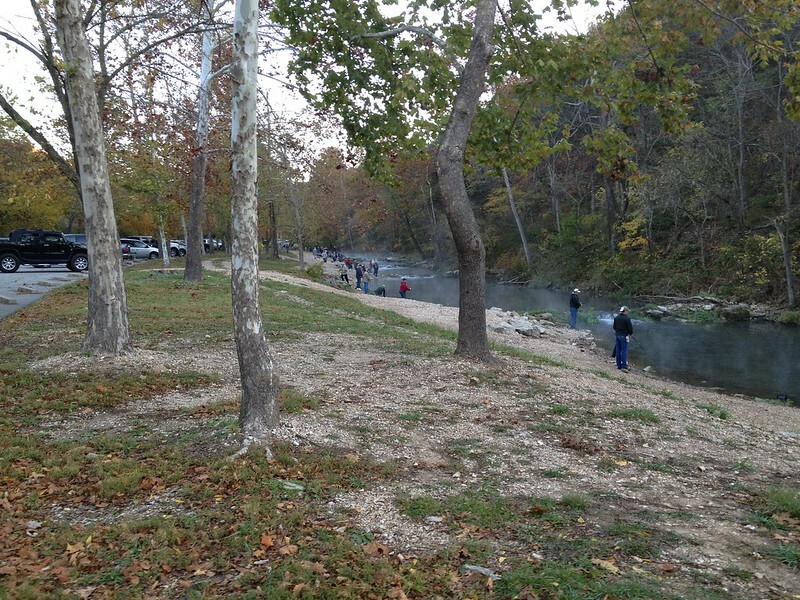 Missouri is a fishing state---trout are not native but smallmouths, catfish and such are. The trout in the picture are some of the purest strains of McCleod rainbows surviving and they do reproduce in these streams. In fact that is what they are just starting to do. Dec. is their big month. They make there reds in the tail gravel beds in shallow water. Great show to watch. I stay out of the stream for the next couple of months while they finish up and the fry hatch out. nice pics. that management approach sounds very interesting. Very nice. It has been awhile since I have fished that part of the country. I did talk an old college girlfriend of mine into heading over to Feathercraft to take some casting lessons, and even join in the free Fly Tying lessons there. She is now an excited Fly Fisherwoman and took a trip with her Husband down to the Ozarks from St Louis for some camping and Fly Fishing.